Today's project was a combination of finally snagging a wish-list item paired with the desire to play with some new materials. Although I did ultimately save a little money, sometimes I just enjoy the process of DIY'ing something because it provides a sense of excitement, accomplishment and drives a little creativity. 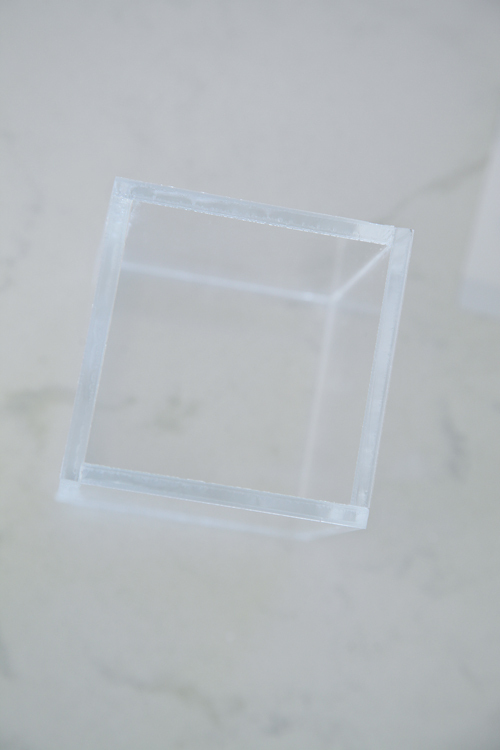 A few nights ago we were at Home Depot searching for a new screen for our patio door, and I stumbled on a stack of acrylic (also known as plexi-glass). I about lost it right there in the middle of the store. I looooooovie me some acrylic! 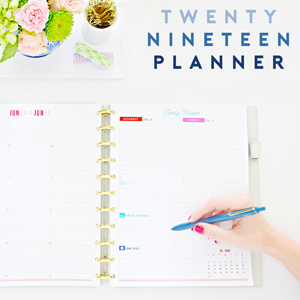 In fact, everything from drawer organizers to under-the-sink organizers to our new island stools... I just can't seem to get enough of it! Why you may be wondering? 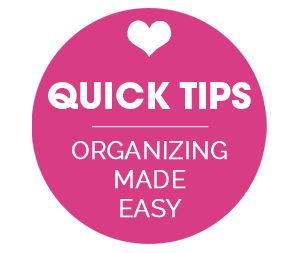 Aside from the fact that acyclic cleans well and is extremely durable, I also think acrylic organizers and decor are timeless and very chic feeling. 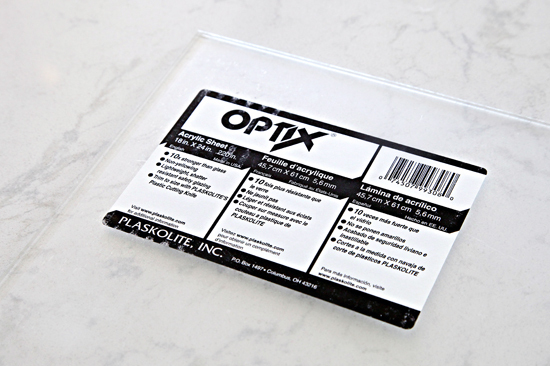 Not all acrylic is created equal, it comes in a variety of thicknesses, sizes and prices. Because I had a few ideas in mind, I picked up a single 18"x24" sheet of .220 thick acrylic (this stuff is thick and beautiful!) Home Depot did have another option that may have also worked, it was about half the price and also about half of the thickness, but it just didn't seem to have the same luster and I wasn't sure how easy it would be to work with. As far as what I wanted to make? 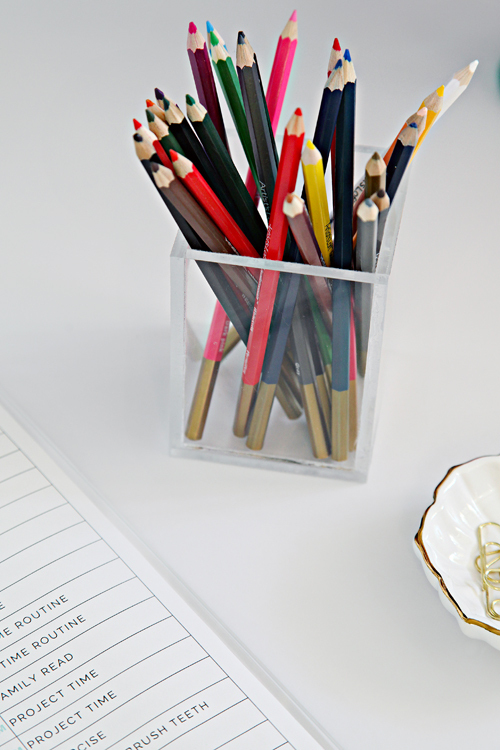 I had a few ideas but ultimately started out with a clipboard and had plenty left over to also make a pencil cup. And even some more left over that may end up in another project some day. The clipboard was my "wish list" item. 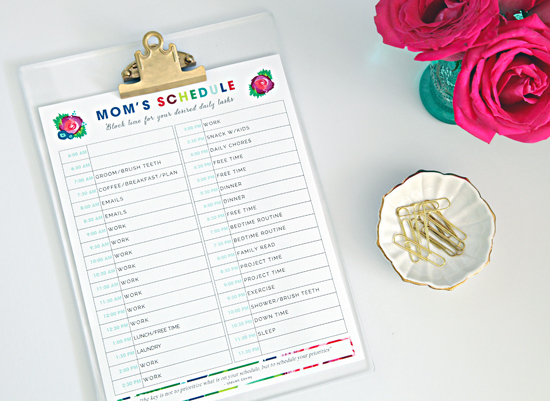 I love clipboards in general and keep them stashed in my cars, pantry, file cabinet... They are endlessly handy. 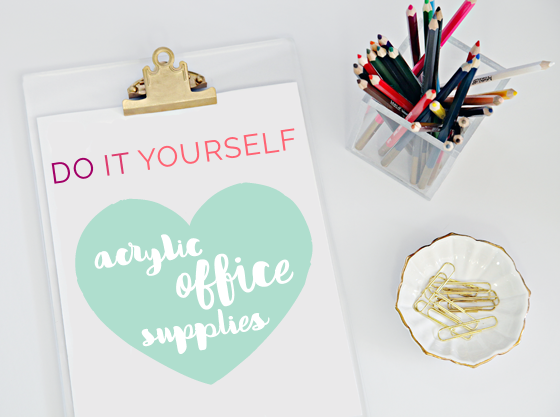 There are a few acrylic options that I have been lusting after, but they always just seemed a little silly expensive for a single office supply. But part of the appeal is the heavier weighted "glass" appearance and the clean look (no rulers/numbers etched in the side). And don't get me started on the hardware! The thing with these is that they are too lovely to tuck away. 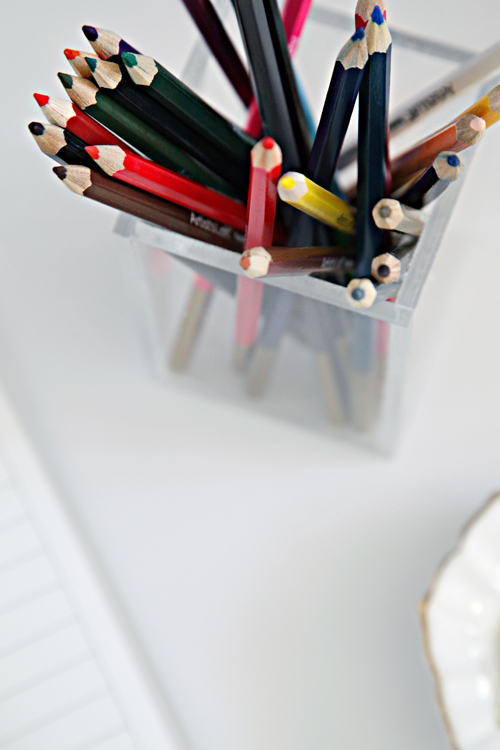 These stunners deserve to sit on your desk and be used daily. 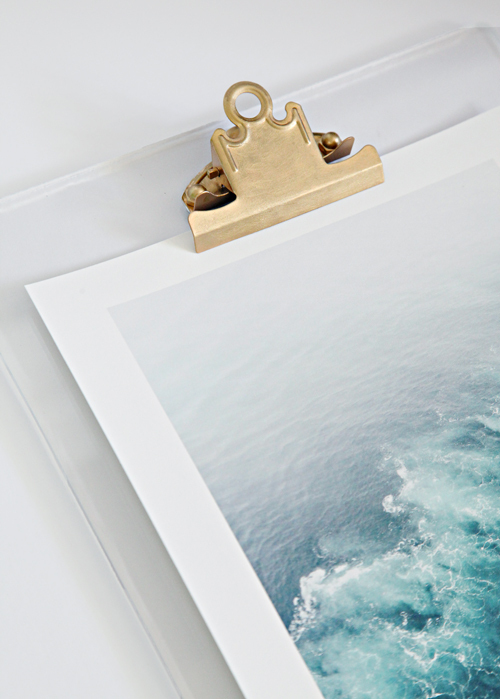 Or they can be hung on your walls to display important notes, a calendar and even art. 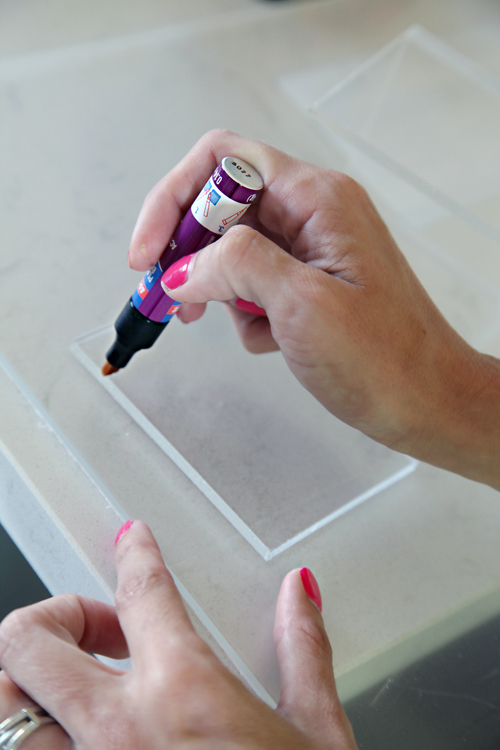 And don't forget, acrylic is also a prime surface to use with dry-erase markers. 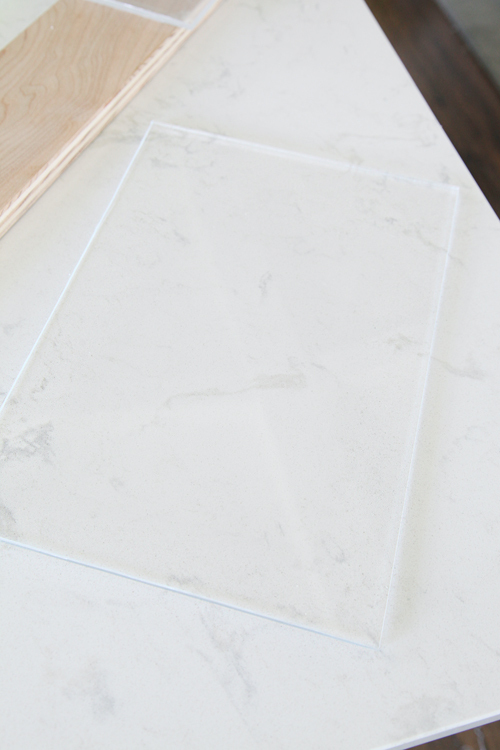 Because I purchased a sheet of acrylic large enough, I could either make two clipboards or a clipboard and something else. I started with the clipboard first and decided to go from there. I also decided that it would be fun to try two different cutting methods for the two projects, so I could share with y'all which worked better. For the clipboard, I opted to try out a plastic cutting knife. 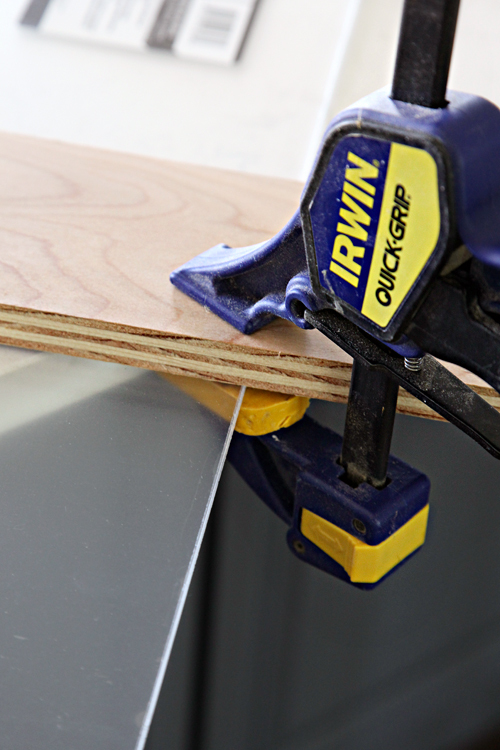 The first step is to clamp the acrylic directly to a straight edge, a scrap piece of wood did the trick for me. Once in place, I pressed firmly to score the acrylic sheet. 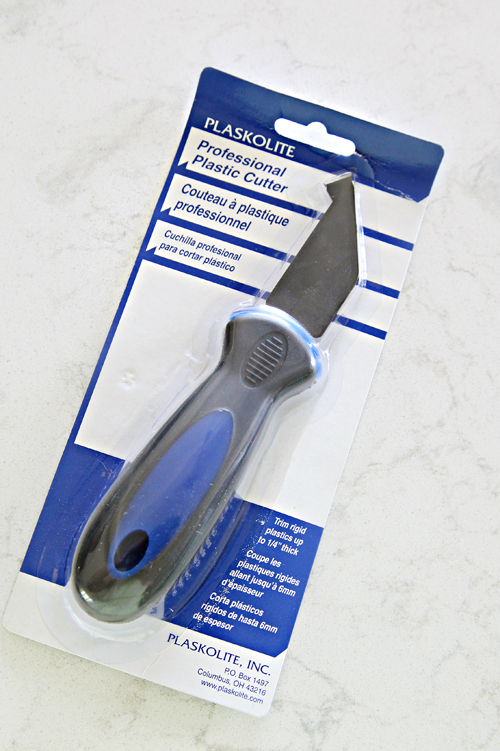 The packaging stated to only score the acrylic to about half of the depth of the plastic, which took quite a few passes of the knife. I left the protective plastic coating on the acrylic while I worked with it just to be sure I wasn't scratching the sheet from the friction. 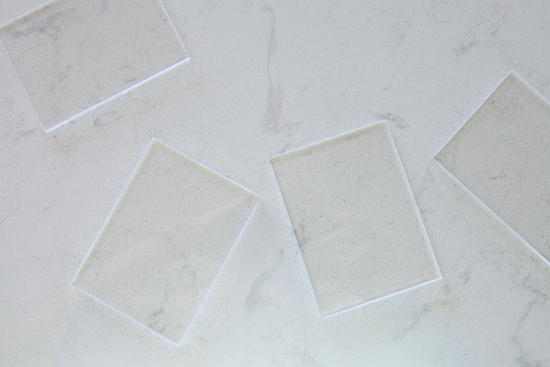 Once it was scored to half of the depth of the acrylic, I placed the scored portion just off of the edge of our counter and snapped the acrylic down. 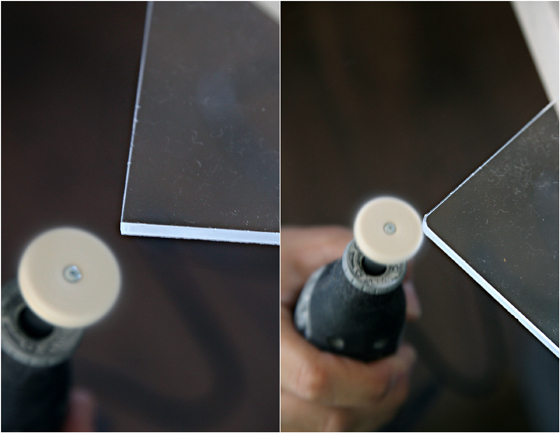 This process created a beautifully clean edge. I peeled away the plastic and admired my smaller piece. The edges can be a little sharp, and the corners can be really sharp, so I turned to our Dremel tool with an attached buffing pad. Very lightly applying pressure to the edge of the acrylic, the buffing pad polished everything up and quickly rounded the edges. 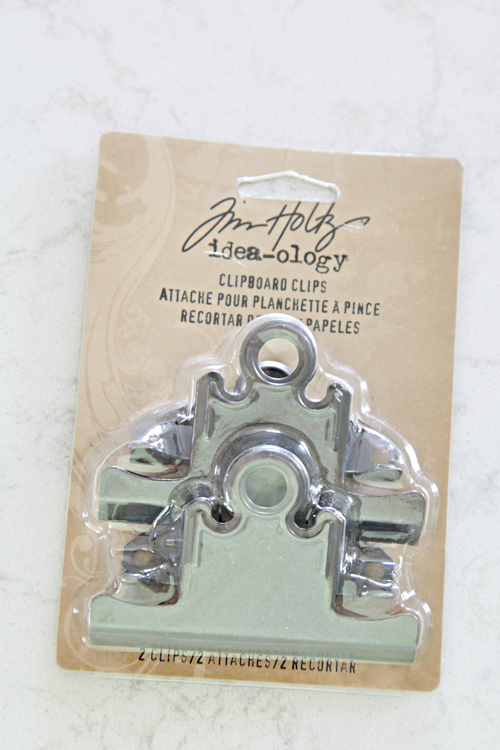 For the hardware, I found two clipboard clips at a craft store for $3. 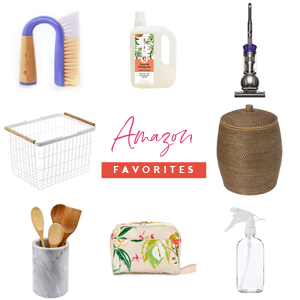 You can also find a few different options on Amazon. 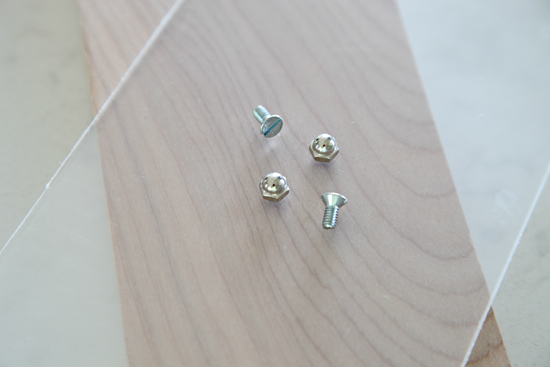 I took the acrylic and clipboard piece to the local hardware store to find appropriately sized screws and acorn caps (our local store charges per piece so you don't have to purchase entire packages). I used a standard size piece of paper to determine the location of the clip placement. Bryan recommended to pre-drill with a small bit first, and drilling in just enough to create a starting point. Then the proper sized bit for the hardware selected. 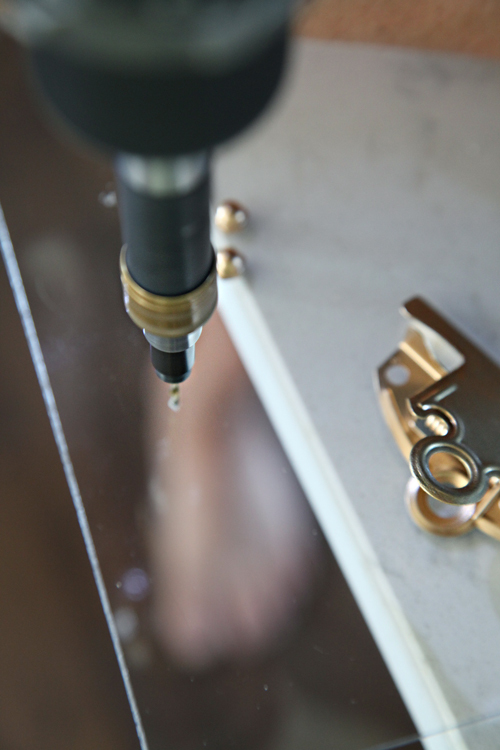 And lastly a countersink bit to allow the screw heads to lay flush on the back side of the clipboard. I also added a thin layer of Gold Leafing with a pen and paintbrush. This gave the clip a more aged appearance. Once the paint was dry, I attached the clip with the acorn caps. The end result was just fabulous!! 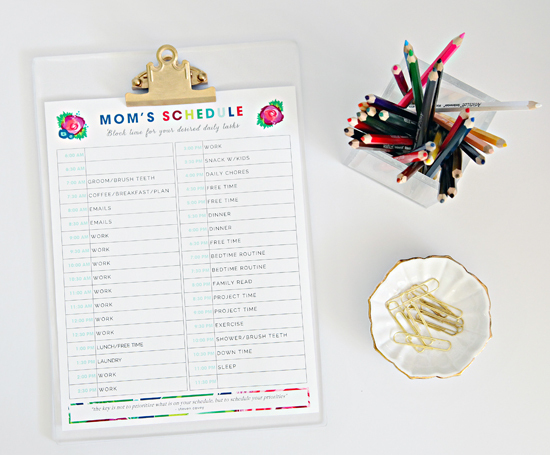 I gave it a spin with a few of my nearby Time Management Printables, and also with a piece of art. Both results were exactly what I was hoping to achieve! Project one, done! There was still plenty of acrylic for more, so next up was the pencil cup. For this project, we decided to save some time with the cuts and ran the acrylic though our BladeRunner (which utilized a fine wood blade). 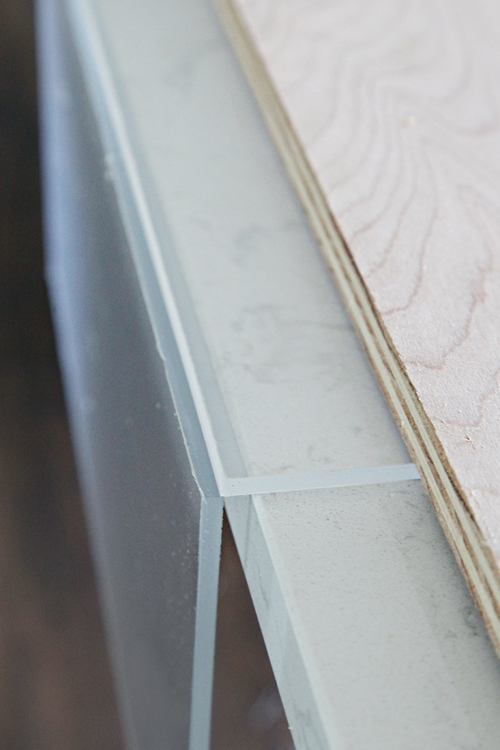 The cuts were smooth, straight and clean, but slightly rougher looking than the score and snap method. 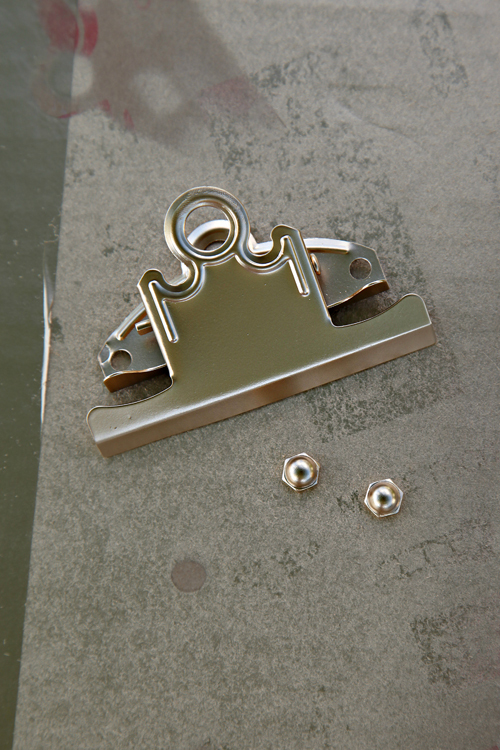 The next interesting fact is that acrylic needs to be glued utilizing a special bonding process. 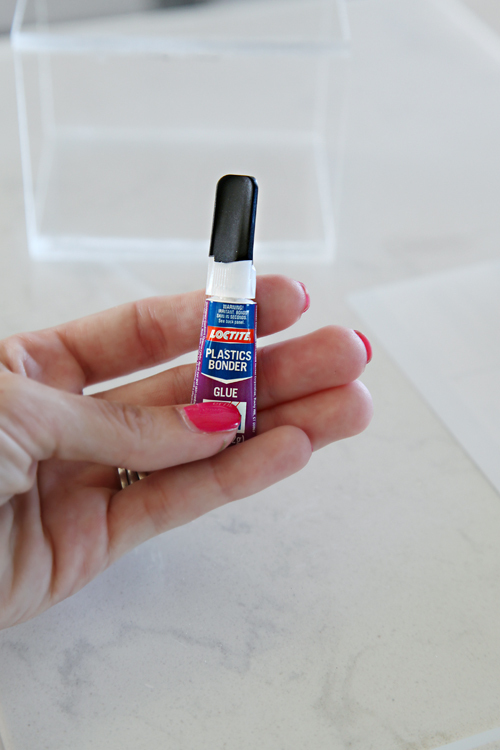 Standard glues and adhesives don't absorb into the super sleek and smooth material, which causes the pieces to slide around and never fully cure. There is a very special acrylic cement that is typically used, but it was really expensive online and I didn't see it sold at our home improvement store. 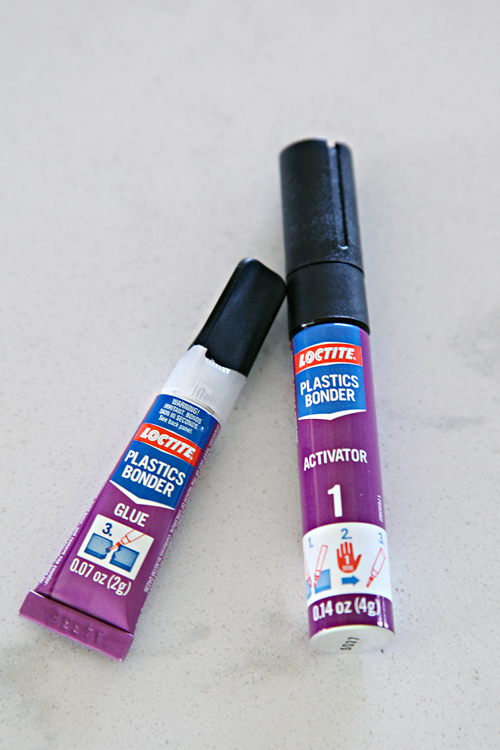 So, I decided to try something that acted in a similar fashion; Loctite Plastics Bonder. 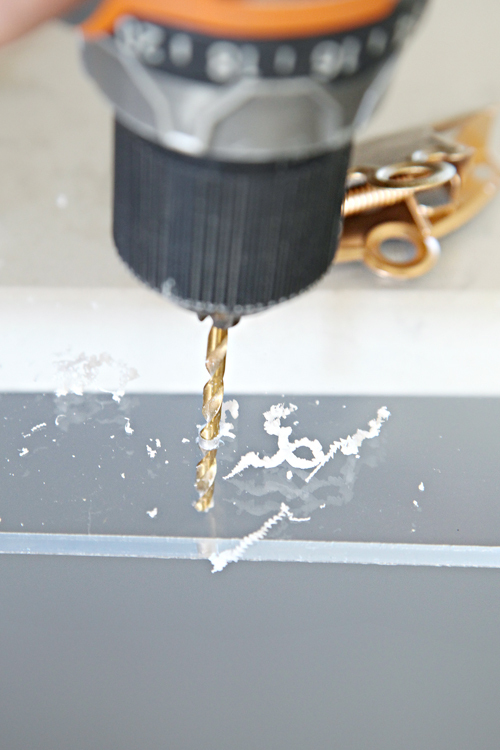 You start by running the activator over each edge of the acrylic being glued. 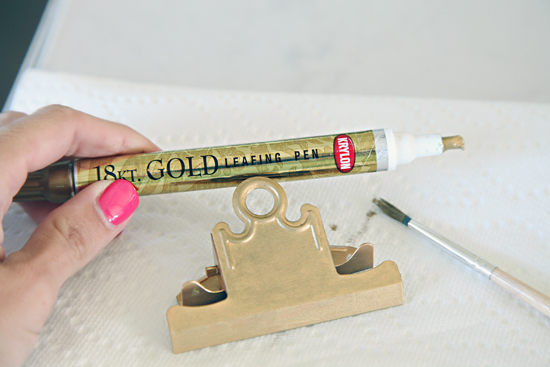 Let it sit for 60 seconds, and then apply a small amount of the glue on one of the pieces being glued. 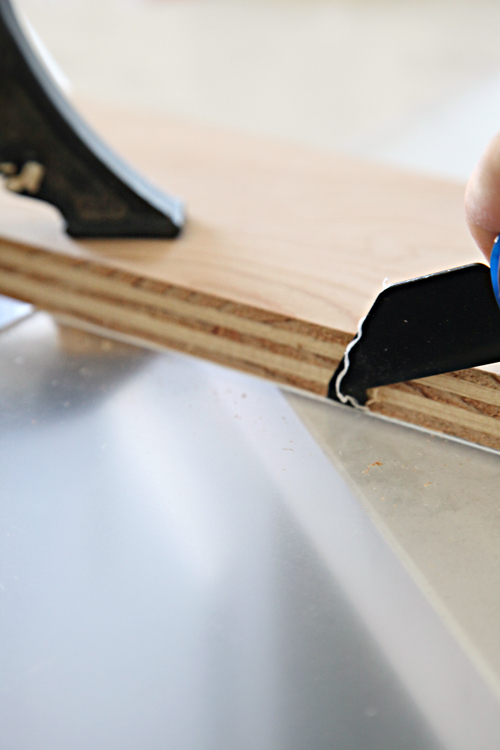 I always picked the rougher, cut edge to apply the glue. I made sure the top of the pencil cup was only factory edges of the acrylic, since that is the most visible portion of the project. Each side of the cup is 3" wide and 4" tall. I then placed the sides on a single square bottom piece. The glue dried clear, and within a few minutes I had myself my very own acrylic pencil cup. That I made. So sweet! And now I am motivated to go and organize my desk, because now I have two gorgeous new office supplies made out of my favorite material. Made by me! In the end, I spent about as much as a single high-end clipboard would have cost, but I was able to gain two different supplies that I like even more than the original inspiration. (Update: Even better yet, I still had enough acrylic from the single sheet to make one more clipboard, so I did!) Most importantly, I tried something new, worked with a material I hadn't worked with before and had fun doing it. Have you stepped outside your comfort zone to play with a new product, tool or material lately? 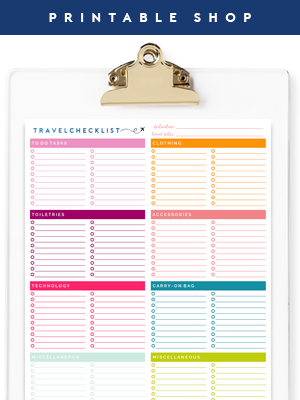 Cute project, however with all the tools that you have to buy as well (at least that I would have to), I think it would be cheaper to buy a clipboard! I agree Antonella, we had a few things on hand that made the projects easier to achieve a nice end result. Just wanted to share what can be done or offer ideas if people were ever looking to play with acrylic. Same concepts could also be used with thin wood. We have this quote in our cosplay group: why buy it for $7 when you can make it for $70. XD Things you discover after you're done. Oh I agree, it's still a great project, that turned out beautifully. You should make and sell them! Love these Jen! I've always wondered what those sheets of acrylic were like to work with. Great tutorial! It Is incredible how you take us step by step through the process of making things here. You really make it easy to follow along in order to recreate the items ourselves. 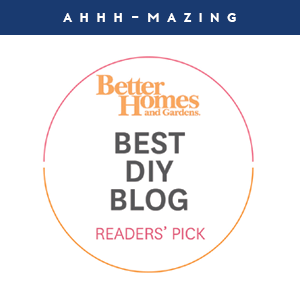 And can I also say that I always find it refreshing here that you create your projects out of love and a desire to create....and not because this is a post sponsored by Home Depot?!?! I don't have a problem with sponsored posts, but it is so much easier to know YOU knowing you created this because you wanted to. One of the many reasons I love your blog. Have a wonderful Saturday! I totally agree with Jamie. Wow, you are so clever. Simply beautiful. I have never seen anyone hand make items like these. Impressive!! I didn't realize working with acrylic was as easy as you made it. Now I have to try that out with a serving tray that usually costs way too much! Totally off topic, but what color and brand is your nail polish? It is so pretty, especially for the summer. Great job, nice to see how much you love to create something unique. Fun! I never thought of making these myself but they're great! I make architectural models, and this is the strongest, and easiest to use. Also very precise; it is applied with a needle tipped bottle. If you plan on making more acrylic items, you should give it a try. Wonderful craftsmanship, by the way! WOW, I never thought of making my own! Love this idea! This is great, Jennifer! Keep up the inspiration! 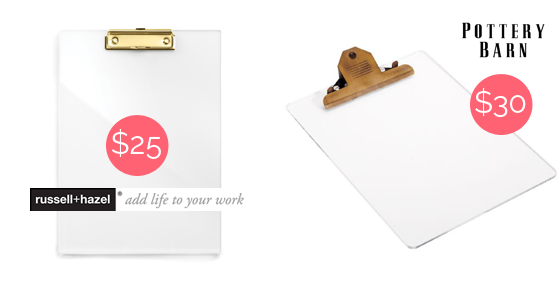 I have a store bought acrylic clipboard that is so plain jane compared to your beauty! I'm inspired now!!! Great job! I might need to do this for custom drawer dividers in our sideboard. I love acrylic pieces. I'm sure that the end product is even sturdier than the original (more expensive) inspiration item! Thank you for this great idea! I had never even considered working with acrylic but I love the look :) Impressive!! Thanks for sharing the step-by step. That is such a great project! They turned out awesome, I agree that acrylic can be timeless and chic and you can design it anyway you want to! Hi! What exact spray paint did you use for this clipboard? I love this!! I love acrylic so much, but it's always so pricey! I had no idea you could just buy a sheet of it and make what you want! By the way, those came out GREAT! I was just wondering what drill bit you used? I'm looking forward to making my own! 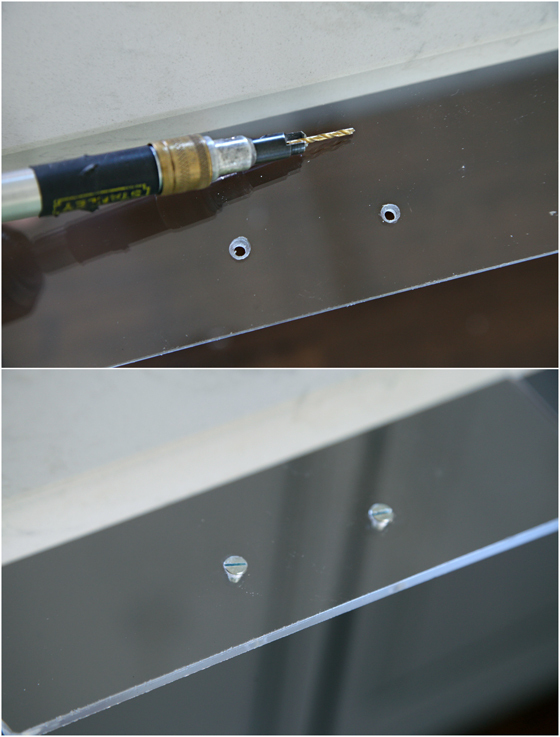 We used a drill bit set with regular ol' drill bits (not a specific type for acrylic). To determine the bit, we started with a smaller sized bit than our selected screw hardware to pre-drill. Then we selected something closer in size to the screw hardware for the actual drilling through. Then the countersink bit to allow the screw hardware to lay flat on the back of the board. 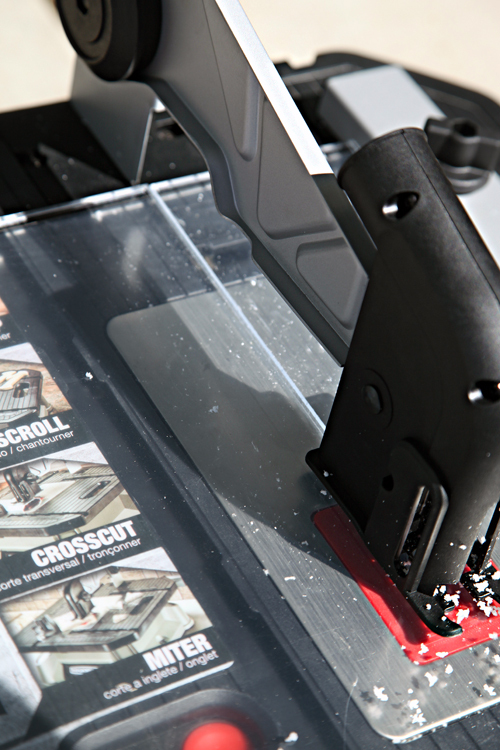 Because the actual hardware you select from the hardware store for your clip may vary, we recommend selecting a bit that is a close fit to the hardware you purchase. Really beautiful job! One of my readers sent me over here to have a look because I'm going to make something similar for tissues. Hate that word "tissues". Sounds like something you shove up your sleeve along with a scotch mint. Again, really nice job.